AGD Equipment, the UK and Ireland distributor for Marchetti and Sennebogen cranes, has taken delivery of a 70 tonne Sennebogen 673R crawler crane and an eight tonne 608M multi-crane for its rental fleet. 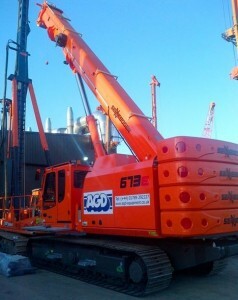 The 608M multi-crane, mounted on a wheeled rather than a crawler or rail chassis, with closer capabilities to a heavy duty telehandler than a crane, can be fitted with various attachments such as, lifting forks/bucket, hoist, a 4.5 to seven metre telescopic jib and an 800kg capacity work platform. Maximum lift height is just over 20 metres with features including an elevating operators cab and travelling speeds of up to 30kph. The 673R features a four section 36 metre main boom and an eight to 15 metre bi-fold swingaway extension which can offset by up to 40 degrees. Features include telescoping track width, which retract to three metres, a tier IV engine and Sennebogen’s Sencon control and diagnostics system which offers a clear view of all operating parameters as well as the ability to fine-tune machine performance.